When you think about a saw horse, what you imagine might be as simple as a plank of wood with four legs to hold it up. This might be all that you need to support cutting wood in some cases, but in other situations, something more modern and advanced is the best option. 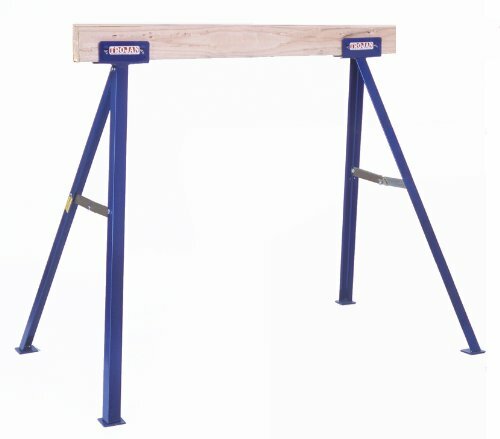 For a professional or a serious craftsperson, the perfect sawhorse might be one that is capable of holding a large amount of weight while being versatile and easy to store. Some saw horses are better than others for specific projects, which means those who work with them every day might have more than one. If it’s important that your saw horse can hold a substantial amount of weight, which means that investing in a high-quality piece of equipment is important. It’s also crucial that the saw horse is made with great materials and has a price within your budget. While it might seem as if a saw horse is the same as every other saw horse out there, that isn’t entirely true. In fact, this is a key piece of equipment needed in a workshop. We’ll share the best saw horses out there today and what to expect from them, so you can make the choice that is right for you. Below we offer some insight into the top ten saw horses on the market today. We consider dimensions, load capacity, and weight of the saw horse. This will give you a basis for how portable they are, how much space you have for your work, and the size of projects that are appropriate for each saw horse. Dewalt DWX725 Heavy Duty Work Stand Saw Horse 15.4 pounds 11 x 36 x 32 inches 1000 pounds Check on Amazon! 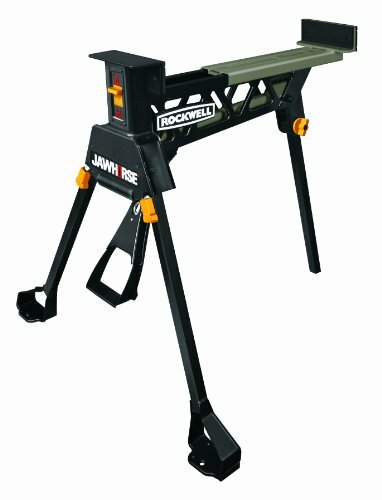 Rockwell RK9003 JawHorse Support Station 46.1 pounds 33.1 x 15 x 15.4 inches 600 pounds Check on Amazon! Worx Pegasus WX051 Work Table and Saw Horse 28 pounds 31 x 25 x 32 inches 1000 pounds Check on Amazon! 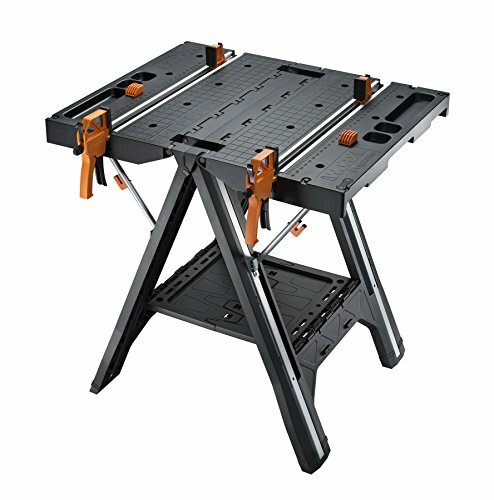 Keter Folding Compact Work Table 26.9 pounds 21.7 x 33.5 x 29.7 inches 1000 pounds Check on Amazon! Rockwell RK9002 JawHorse Sheetmaster Portable Workstation 53 pounds 39.8 x 17.9 x 15.9 inches 600 pounds Check on Amazon! Hitachi 115445 Folding Saw Horse 11.8 pounds 32 x 5 x 27 inches 1200 pounds Check on Amazon! ToughBuilt TB-C700 Saw Horse 22.9 pounds 5.1 x 39.8 x 5.5 inches 1300 pounds Check on Amazon! Worx WX065 Clamping Saw Horse 16.3 pounds 35 x 28.1 x 6.4 inches 1000 pounds Check on Amazon! Black & Decker WM125 Workmate Work Bench 14.2 pounds 33 x 5 x 5 inches 350 pounds Check on Amazon! Trojan TS-35 Tall Saw Horse 16 pounds 41 x 6 x 4 inches 1000 pounds Check on Amazon! A couple of things stand out right away with the Dewalt DWX725 saw horse. One of them is that it comes in a compact design. It weighs in at just over 15 pounds with dimensions of 11 x 36 x 32 inches. The design allows you to fold up the tool when you aren’t using it. This also means that storage is a simple proposition. For contractors who need to transport tools to and from various sites will find that the DWX725 makes that sheer simplicity. It’s made of a lightweight aluminum to combine portability and durability in one. This saw horse can also double as a work table using a piece of plywood or a similar material. It can hold a weight of up to 1000 pounds and comes with handles for easy movement. While this foldable sawhorse works for transport, it does include levers on the legs to lock them in place. This means that you don’t have to worry about them moving from the position you put them in. The saw horse will be steady and support all your projects as you work on them. On top of that, the price for this saw horse is completely reasonable considering the features it has going for it. Those who are familiar with Dewalt will be aware that it is a top company in the power tool market, which makes the quality of this saw horse no surprise. It also has some great features that are representative of the brand. It includes a transport latch which gives you the ability to transport a pair of stands together, if needed. While the mounting brackets are an additional purchase, this also gives the ability for the saw horse to be a robust tool stand. The RK9003 from Rockwell is a versatile saw horse that is simple and inexpensive but still retains a large amount of power. 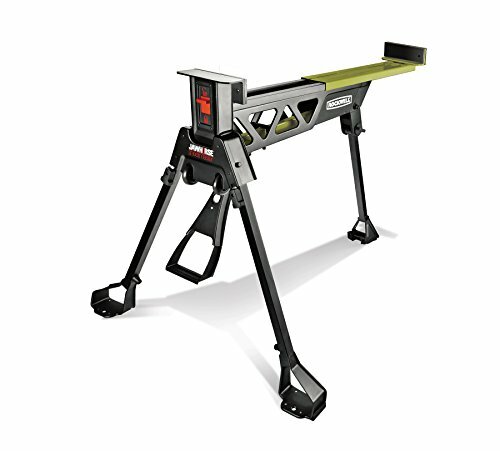 The tripod construction of the saw horse gives it an edge above other options when it comes to use on uneven ground, such as a sloped floor of yard. Beyond that, it also has legs that can be nailed into the ground which makes it even more ideal for outdoor applications. This isn’t the only thing this saw horse has going for it. It has a decent amount of strength and can hold up to 600 pounds of material. The foot pedal clamp on its own can also hold 200 pounds. This saw horse is made out of steel for durability and a long life. The clamping force makes this more versatile than the average saw horse. The clamps are capable of supporting or holding a large number of heavy items while you work with them. The jaws on the RK9003 can accommodate planks of up to 37 inches wide, which also makes it more than sufficient for use as a circular saw table. It can also hold doors and other large items horizontally, vertically, and in any other angle you prefer. The jaws are padded which will ensure that no scratching happens to the surface of your project. It will also help keep your work from wobbling or moving while you work. The saw horse has wheels, so you can pull it along wherever you want, but also collapses into a smaller version for easy transport. It’s one of the heavier models on the list at over 45 pounds but that also means that it is solid and can take abuse. 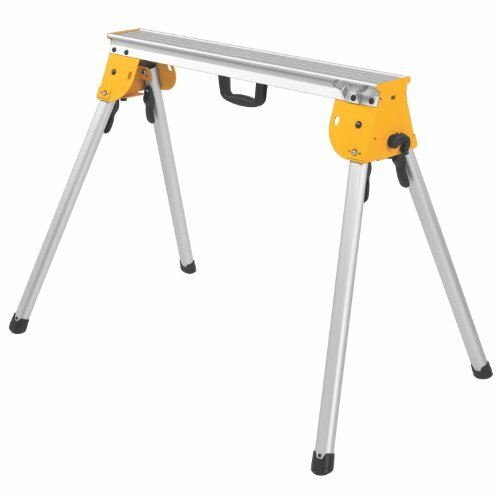 The Worx WX051 is a versatile tool that can work as a saw horse or work table. When used as a table, it offers a surface that is 25 by 31 inches. This isn’t the largest on the market, but it holds a decent load and weight even at that size. If the table isn’t quite large enough for your needs, you can attach a second work table for a much larger space to work on. The height is also reasonable at 32 inches off of the ground, which is appropriate for most. It has four legs and distributes weight well but is best on even, flat surfaces. Another nice factor of this saw horse is that it includes a bottom shelf that is designed to store things like your toolbox, power tools, screws, oil, and other things. It also comes with two bar clamps that can open up to 18 ½ inches, along with four holding legs. This will give you everything you need for cutting, nailing, drilling, sawing, and more. It also has locking legs so there typically is little movement when working on a project. As for the surface of the table, it has a measuring scale engraved on it. This removes the need for a measuring tape cluttering up the work area. While this is a fairly lightweight saw horse at under 30 pounds, that doesn’t mean that it doesn’t offer the performance you want. When it’s used as a work table, it can hold up to 300 pounds and when using it as a saw horse, it can hold up to 1000 pounds. That’s pretty substantial and will fit the needs of most. However, keep in mind that the surface is not completely flat which may require some adjustments depending on the work you plan to do. This saw horse is a lightweight version that is designed for DIY and home use. When used as a work space, it provides 33.5 x 21.75 inches of space. There is also a secondary storage space underneath to hold tools and any other tidbits you need close by. As a saw horse, it can hold up to 1000 pounds while the work table can hold 400 pounds. It’s quick to use courtesy of a quick-open feature and closing it is just as simple. Once it’s closed, it can be stored easily and takes up very little space. Most of this saw horse is made of polyethylene, while the legs are made of aluminum. 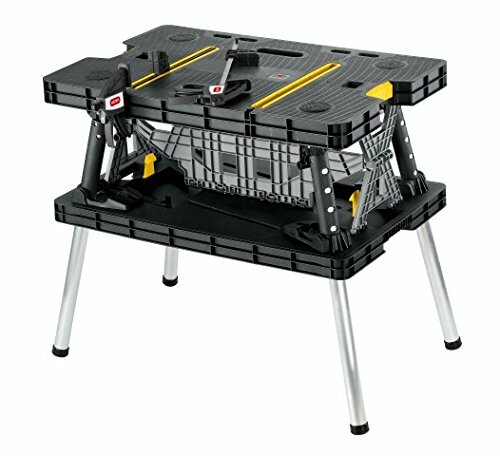 One of the most unique facets of the Keter folding compact work table is that it has many options for clamping. It comes with two squeeze clamps which easily slide into slots on the surface of the work table for horizontal clamping. There are many additional slots and drills holes for convenient storage. It also comes with a carrying handle, so transport is not an issue. There are also many other accessories and parts available, but they will come at an additional charge. This is not a saw horse or work bench for professional use, but it will do wonderfully in a home workshop or DIY situation. The clamping system makes it better than similar alternatives where versatility comes in. However, the polyethylene construction may not hold up to extreme use. For those who are hobbyists, it is a reasonable option that comes at an inexpensive price. The materials it is made from are weather resistant, so it can be used in any environment. As can be expected from a saw horse from Rockwell, this product is a beast. It weighs about 43 pounds and is made from solid steel. It also offers clamping capabilities that are far and beyond the norm. If you aren’t cautious and aware, you could clamp plywood to the point where the edges break. The good news is that in most cases, this means much easier working with light woods. It can hold any light stock you need and incorporates a jig to hold the materials stable if you will be cutting something more substantial. The design for this saw horse is a tripod and traditional in nature, except that one end has a massive vise. When set up appropriately, it’s stable. However, it includes wheels for mobility when the device is folded up. When in this state, the third leg acts as a handle for pulling. The vice itself is operated by foot, this is a convenient option. It can be used similarly to a bench vise or machine press, depending on the material you are working with. It also allows you to mount a chop saw or table saw on a piece of wood that is clamped into the saw horse for a cutting station. It might seem as if this machine is best used as a simple worktable, but it goes far beyond that. There are numerous clamping configurations to the point where it can nearly take the place of a second worker. For a portable saw horse, it offers plenty of features and the power you want for clamping. The biggest consideration here is the fact that it is rather tall, which may lead to back strain for shorter workers. If you have bought woodworking tools in the past, you’ve likely heard of the Hitachi brand. It’s recognized around the globe for providing quality products to DIY hobbyists and contractors. As such, this pair of saw horses is fantastic for the garage or home workshop. The set comes with two saw horses and four saw bucks, and all of these items are made to be space saving. There are built-in shelves to store your tools as you work and can support up to 1200 pounds across both saw horses. It also features built-in cord hooks for extra convenience. What marks this saw horse set as a true keeper is the low price associated with it. Even the budget conscious beginner can come up with the cash to purchase this set, which will likely last a long time in a home or contractor environment. The indentations on the top of the product ensure the best stability and make the tool easy to use for beginners or experts alike. It may not have a lot of extra features, but the bare-bones design works for the price and will be plenty for many power tool users. This set weighs under 12 pounds and has dimensions of 32 x 5 x 27 inches. The included saw bucks will help support a 2 x 4 of a substantial size and they can provide an option to extend or raise the workspace to support 4 x 8 sheets, as well. For the home user, these are sure to last and will do the job for irregular use while taking up little space when not in use. 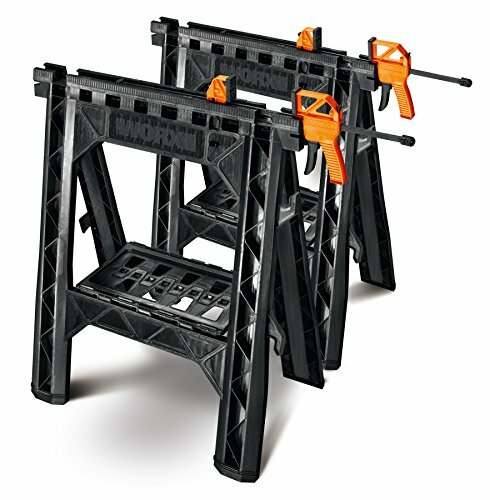 For the price, it’s certainly one of the best sawhorses on the market. If you are looking for a sawhorse that is high-quality, durable, and not outrageously expensive, the TB-C700 might be the perfect option for you. It doesn’t matter if you’re new to woodworking or have been at it for decades as a professional, this saw horse has all the features you need. The entire saw horse is made from steel with a heavy-duty powder coat and a zinc-late finish. It weighs in at just under 23 pounds and has dimensions of 5.1 x 39.8 x 5.5 inches. This saw horse has a capacity of 1300 pounds and when purchasing two of them, you get a durable and robust worktable for the job site. The saw horse comes with support arms which are built to fix 2 x 4s and 4 x4s, so the versatility is obvious. The legs are telescopic, which means that they will work on any surface, no matter how uneven the terrain might be. In addition, the legs can be adjusted to offer the right height for each user. There are support and material cutting pegs which add to the usefulness of this saw horse. Getting started with it is a breeze courtesy of the fast-open mechanism. The coatings mentioned above also help prevent corrosion and make this a saw horse that can be used in any environment it is needed in. When it’s folded up, it also comes with a handle for easier harrying and rolled edges for comfort and safety reasons. This is one saw horse that can stand up to most anything you throw at it and would be at home in your garage, workshop, or any job site out there. This is another saw horse that comes as a pair which also includes cord hooks, bar clamps, and a tool shelf underneath. The saw horses are made from a thermoplastic polymer and have a combined load limit of 1000 pounds. The clamps which are included are able to be attached horizontally or vertically depending on the project you are working on. When you’re done with your work, the items fold up flat and take up next to no space (only 2.5 inches width) while being stored. The cord hooks are a great feature if you use the saw horses together as a work table. You can keep any important wires or cords nearby while you work with power tools. These saw horses are best used by home hobbyists or those who enjoy a spot of DIY. They have capabilities to complete all sorts of projects while streamlining your workspace for better organization. The included clamps work on materials of up to 18 inches wide and keep them nice and secure while you are on the job. These WX065 saw horses will come shipped fully assembled and are capable of anything you want to do around the house. With the addition of plywood or another sheeting material, it can make a fantastic work table that can be broken down and stored when the work is done. These saw horses come with a three-year warranty, so you know you’re getting products that are strong and durable. At a great price and with the features you need, these are a fantastic solution for your workshop needs. 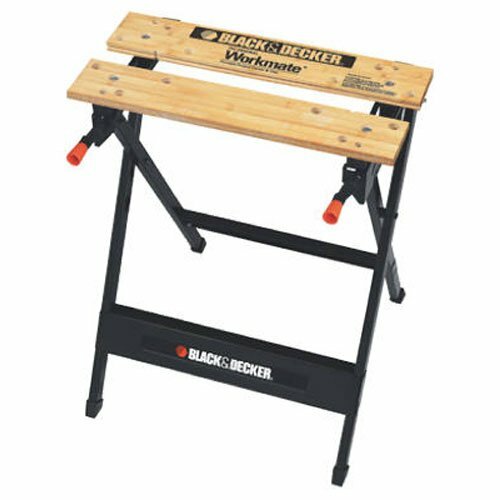 If you are looking for a truly inexpensive saw horse or work bench that is also lightweight, the WM125 from Black & Decker is sure to be one to consider. For the price, it has a reasonable amount of versatility for the home workshop or DIY projects. It’s quite easy to fold up for storage or move from one location to another. It features a flat folding type, so it can fit nearly anywhere when not in use. It also has a steel frame which makes it more durable than you might expect when glancing at the price tag. While it doesn’t hold as much weight as the other saw horses on this list, it does have a capacity of 350 pounds. For those who work with smaller and lighter projects, the lack of additional capacity may not be a serious problem. What it does hold, it does well. The frame keeps things supported well even if you are hammering or cutting on the surface. In addition, it includes swivel pegs which add additional depth to the product. This means you can clamp all sorts of things, even those of an odd shape, and can work on them without worrying about stability. This adds to the versatility of the workbench. The jaws on this saw horse are built to resist warping and can be used for workpieces with distinct shapes. This is a positive that not even some of the most high-quality and expensive work benches can boast. Overall, the saw horse is an inexpensive option for a home garage or work shop but isn’t going to cater to those who work with power tools on a professional basis. For everyone else, it comes highly recommended and will last no matter what projects you work with. The TS-35 from Trojan is an innovative saw horse that comes as a set of legs. This allows you to choose a piece of 2x lumber in the length you prefer to accommodate your project’s needs. While this might seem like a cumbersome process, Trojan has made it straightforward and even beginners should have no issues with it. The saw horse is tough and strong with a capacity of 1000 pounds. It also offers adjustable legs that will work on any sort of terrain. This saw horse comes with a powder coated and plated finish to ensure a long life. It also features a lifetime warranty, which goes to show how serious Trojan is about offering an excellent product. It also has a 1/8-inch welded construction that includes folding legs for storage purposes. The legs that come as this saw horse offer assemblage through gripping teeth, requiring no nails or screws. It can fold down flat, as well, for transport or storage purposes. While this saw horse can be used on any terrain, it does come with bolts that aren’t top quality. It’s possible that you will need to replace those as time goes on. The welding also isn’t always the most aesthetically pleasing but it does result in a solid and durable saw horse that does exactly what it was made for. With a lifetime guarantee, that takes some of the sting out of the tiny issues that may or may not be present when purchasing this product. It’s beginner friendly but capable of more advanced work, so it is likely to appeal to a wide range of buyers. Saw horses can be found at job sites, in workshops, and even in garages across the country. They offer a portable option for a work stand and can be moved from location to location with ease. For those using them in their homes, they can work as a dedicated worktable without the expensive price tag. While they do take up space that might be used for other things, many of these saw horses have shelves or space to make them versatile and offer easy access to needed tools. When choosing a saw horse, there are a few configurations to consider. Some of them come completely assembled and ready for use. Most of these only need to be unfolded before use. Other saw horses require assembly but only in terms of providing and installing a beam. The final type come sans legs or beam, so both need to be available to you in another way. Everyone has their own preferences, so all three types are common to see. You’ll need to consider what matters most to you before going forward with a purchase. • Transport Potential – A manufactured saw horse is often much more portable than a homemade one. You can fold up the saw horse when you are finished with it and stick it somewhere for storage. It also makes moving from location to location much easier. 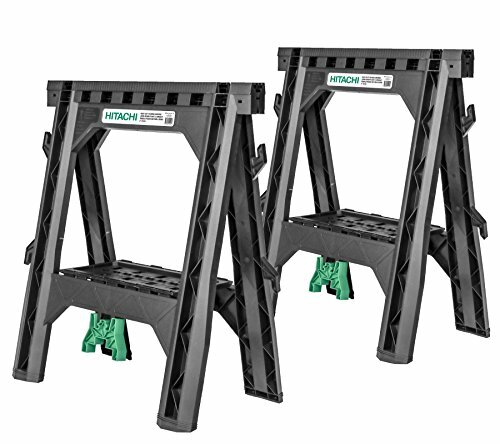 This type of sawhorse is typically fairly lightweight and will offer a carrying handle for convenience. • Strength Options – The best saw horses in terms of strength tend to be those that are composed of metal. Leg only models often top the charts here when you add a 2 x 4 as a crossbeam. Wooden saw horses are also strong, but increasingly difficult to find. Plastic are commonly the saw horses with the least load capability. • Comfort – Most saw horses are somewhere between 24 and 28 inches, which is also a reasonable height for the average person. However, if you are shorter or taller, this may not be the right size for you. In that case, we recommend that you select a model with adjustable legs to avoid back strain when cutting on the saw horse. Crossbeams are also important to think about. Some people will prefer a narrower beam for long runs of trim or other material. However, a wider beam is the best option for those who plan to use the saw horse as a work bench at least part of the time. There are many things to think about when looking at saw horses for your garage, workshop, or business. We’ll share some of the most important and give you an idea of your options and what you can expect. There are saw horses that come with adjustable height and those that are a fixed height that cannot be altered. If you decide to purchase the latter, you will want to be certain that the height is at a level that will be comfortable for you when working. 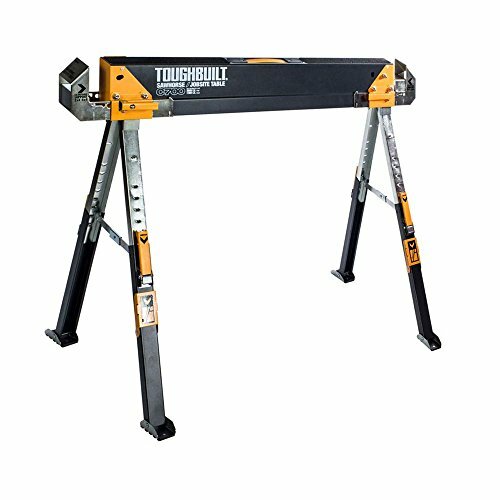 Those who work on multiple projects may appreciate an adjustable height saw horse, since you can adjust it up or down, depending on your needs. However, those who don’t mind nonadjustable models for whom several models exist. If versatility is important to you, make sure to consider adjustable height saw horses as they will best fit your needs. You will need to be aware of the dimensions of the work surface when you are considering multiple saw horses. If you often take on large projects, you don’t want a surface that doesn’t accommodate most substantial pieces of wood or other materials. Take time to consider what you will use the item for and whether it truly meets your needs. Saw horses can be made out of numerous materials and each of them have pros and cons. You’ll mostly find versions that are metal or plastic, but wood is another option. As far as plastic goes, it has a reputation for being lightweight and easy to move from place to place. However, most plastic models are not capable of holding as much weight as a wooden or metal saw horse might. With a wooden saw horse, you will find they typically do not fold down and can also be difficult to move due to their extreme weight. However, they are known for having a high weight capacity. A metal saw horse is your final option and these are often heavier than plastic, but not always to an extreme degree. Many of them do fold down and can hold a large load while you work. If you are planning to use your saw horse on a regular basis, want to move it from place to place, or have little space for storage, a folding saw horse is going to be your best option. Those who have a large amount of space and don’t plan to cart around the saw horse may not care as much about these factors. However, folding saw horses are decidedly more convenient and easier to store than those that cannot be folded down. In most cases, the recommendation is to go with a folding model if at all possible. It’s easier to store in a corner somewhere and can open up your workspace for other needs when not being used. Many saw horses, but certainly not all of them, have a shelf or other feature included where you can place and store tools when they are not in use. Some people appreciate this feature and use it for all sorts of things, while others consider it something they can take or leave. You will need to consider how much of an asset this is for your own work and whether it matters. However, it should at least be considered when looking at your various options. Some models even come with easy access to cords, which can also be a positive when you work with your power tools. Whether you plan to use your saw horse as a work surface or not, you need to be sure that the product you purchase is of a high quality. There’s no point in purchasing a saw horse that works well for a few months but then breaks down on you. You’ll be back in the same position as you are now and searching for an alternative saw horse. The most important factors in being high-quality are strength and durability, so do your research there. However, you also want to be sure the weight and height of the model is sufficient for your needs. Take careful consideration about how the saw horse is going to be used and then consider the models that meet those needs. While there are many things to think about when buying a saw horse, the options offered here should provide what you need. Whether you are a professional doing heavy-duty work on a regular basis or a homeowner who wants a saw horse to use sporadically, one of these options will offer what you need. What is most important is being use the saw horse is right for you and understanding how the features factor into that. Good luck!